I had a pretty good foundation in forest ecology leaving graduate school, but I’ve really developed my forb and grass ID skills since starting work here in Wood River. Prairie ecology has grown on me. I was trying to explain it to a forest-loving friend: once you know the local plants, (that is, you see their uniqueness and their ecological and historical roles), you get a better feel for a place. One of my favorite stewardship tasks is harvesting native seeds. The best assignments are for hard to find plants that require some knowledge of their life history to locate. I really enjoy the scavenger hunt and foraging aspects of searching for less widely distributed species. I also had one of my major botanical victories seed harvesting on the prairie. Prairie seeds drying in our seed barn. Platte River Prairies, Nebraska. Photo by Eliza Perry, Hubbard Fellow. As a natural history geek, I can’t help but delight in picking up random facts about prairie plants. 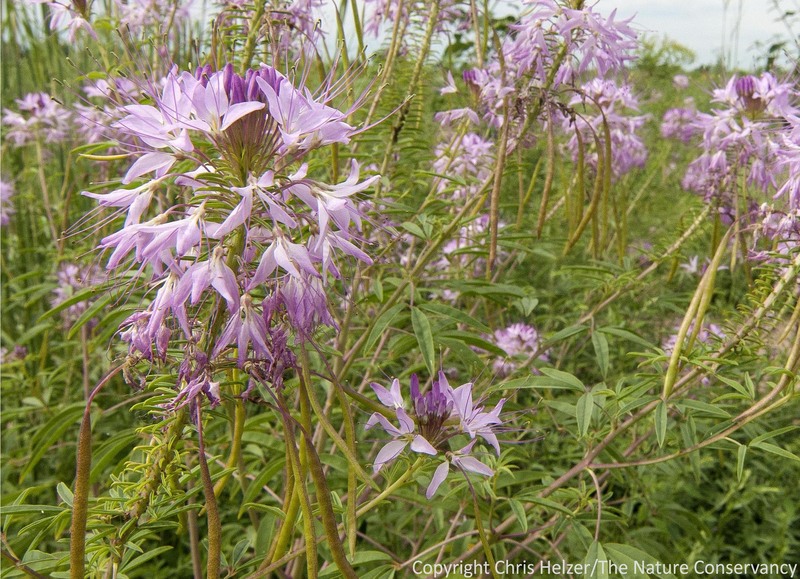 For example, rocky mountain bee plant (Cleome serrulata) is a glorious nectar source for pollinators in mid-summer. Doves eat the seeds in the fall. Its leaves and seeds were also eaten by some Native Americans, “in spite of its strong smell” (“Grassland plants of South Dakota and the Northern Great Plains”, Johnson & Larson 1999). It takes all kinds, the authors seem to say. I didn’t find the odor especially displeasing, but evidently even botanists have personal opinions. Rocky mountain bee plant. Platte River Prairies, Nebraska. Foxglove penstemon (Penstemon digitalis) is one plant whose smell I do find distasteful, and its fragrance garnered no mention. This wildflower is not widespread, but neither is it difficult to find. You smell it before you see it. Interestingly, it’s the seed heads and red stalks that stink, not the flower. I left a bucket in the cab of the truck while I harvested other things, and when I came back the cab was filled with flies. They followed the bucket to the truck bed when I moved it. Most of the seeds we collect this year will be used in over-seeding projects, intended to increase the diversity of prairies we manage. Over-seeding is one strategy we can use to boost a site’s forb population without tearing up the prairie and starting over. 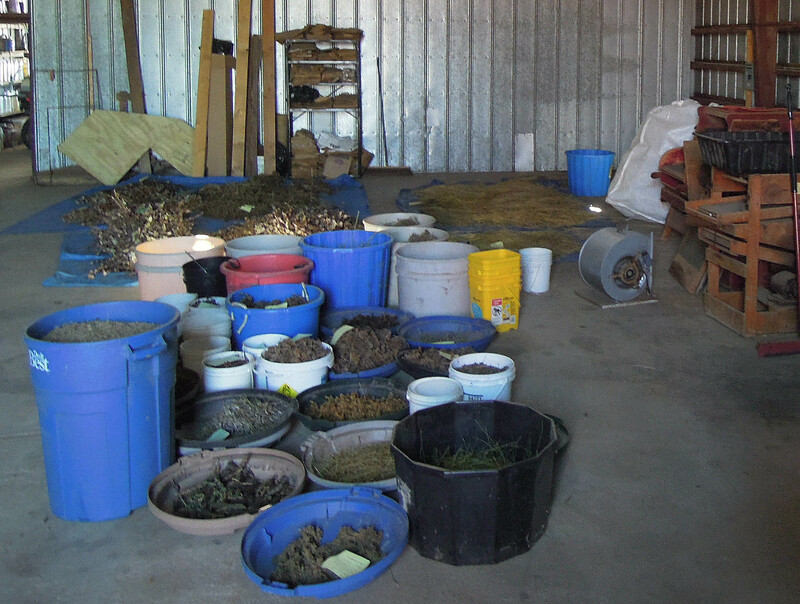 Building a native seed bank of local ecotypes is a useful technique to increase your chances of success in prairie restoration. It’s not bad work either, if you can get it. This entry was posted in Prairie Plants, Prairie Restoration/Reconstruction and tagged anne stine, hubbard fellowship, prairie restoration, seed harvest, the nature conservancy by Chris Helzer. Bookmark the permalink. Anne, Nice post. Congratulations on your growing knowledge and appreciation for prairie ecology, plants and native seed collecting. I haven’t met Cleome serrulata yet; how gorgeous. I have ornamental Cleome at my house and to me the leaves/stems do have a pungent smell. The flowers get a lot of insect visitors though. I agree with you that Penstemon also has a ‘unique’ odor. Hi Anne, I believe the Tall Grass Prairie extended all the way to the East Coast. I think the reason it is no longer a predominant local ecosystem is because prairie areas were the first to be developed in the 1600’s. It is easier to develop open areas because no trees needed to be cut. Also, fire suppression has occurred for much longer in the East than the Midwest. If you look at the flora of the East Coast states you will see many species occur infrequently or are noted in historical records. I have seen species in barren habitats, sand deposits, thin soil area, and even in power line corridors that are characteristic of Midwest prairies. p.s. If any of the readers of “The Prairie Ecologist” are interested, I created a group specifically to discuss seed collecting for ecological restoration. There are pictures of seeds and seed pods/capsules, pictures of seedlings, discussion of methods, and sharing of success with seed gardening. Please click on the link below to read some of the posts and view the pictures. With more contributors I think this could be a valuable resource for restoration practitioners. I enjoyed your post, Anne. I do not have a prairie, but have a number of native plants in our yard. I planted native Cleome seeds last fall, but was sad that they didn’t come up. I do have some of the cultivars, though. I have a number of Foxglove penstemons that have not bloomed yet, so have their odor to look forward to, or possibly avoid. James McGee, I am helping with a butterfly garden at a local Girl Scout day camp, where the previous owner had planted prairie grasses many years ago. It has just a few native flowers, but a number of not so desirable plants are also there. There are areas of brome and buttonweed. They cut and bale much of it each year to create a fire barrier. I would love to get permission from the group of people who own the property, and lots of bodies to pull some of the weeds, and overseed, like you mentioned. The nursery the group worked with before asking for my help sold them a number of non native plants, but I managed to talk them out of buying as many as they were going to from the garden center, and got some from UNL’s Arboretum, and dug some plants from our yard. Since it is right next to the sort of prairie, I feel we need to be careful what we grow there, in case the seeds from our plants end up in there. Hi Sue, You are right to be cautious about planting next to a prairie. Ironically enough, even some horticultural varieties of native species have proven invasive when planted adjacent to a natural area. A good example is Physocarpus opulifolius, Ninebark. In contrast, there are a number of non-native species which are wonderful for butterfly gardens that never escape from cultivation. Examples include Petunias and Zinnias. Recently, I enjoyed watching a Sphinx moth and a hummingbird sipping nectar from hostas and snapdragons. I love the smell of Clethra alnifolia in summer, an east coast native, and the butterflies love the flowers. I am not going to tell you to only include locally native species in your garden, but please do research to make sure any species you include has been found to be unable to escape from cultivation in your area. Lucky for you, one of the best plants for attracting Monarch butterflies is native to your area. Unfortunately, I am just a few counties east of the range of this plant. A patch of Liatris liguistylis is like a truck stop for Monarch Butterflies on their migration to Mexico. You should have lots of this plant in your garden. I also would not be without many of the native species from the following list. Additionally, I would include Lithospermum. The black swallowtail butterflies seem particularly fond of Puccoon. I suggest you not import native plants if the species already exists in a nearby natural area. I suggest you collect seed and grow the plants from seed. The result will be a garden composed of local ecotype genetics that would be suitable for restoration of nearby natural areas. You could also distribute your extra seed locally to gardeners to help improve our urban habitats for wildlife. Thanks, James! I counted 16 of the plants on the list at Prairie Moon that we have planted. I don’t remember if we got the Liatris liguistylis, but we did get aspera and another kind, either that, or maybe punctata. When I first looked at images of the Lithospermum, I didn’t think I was familiar with it. I am thinking that may be one of the flowers I planted in our front yard that I couldn’t remember the name of. The Nebraska Statewide Arboretum is having a plant sale later this month. I’ll have to see if they have it. That’s where I would have gotten the one I forgot the name of. I bought a packet of heirloom zinnia seeds to plant in the spring. I didn’t know they could reseed into the prairie. Unfortunately, even though I had said I had Anise hyssop, they got a cultivar, so I’m sure they will cross pollinate, and we will have our own kinds of it. They also bought 2 butterfly bushes, and some other cultivars that I would not have planted there. The prairie was planted by the previous owner of the land, I’m thinking, over 20 years ago. I’m not sure where he got the seeds, but it is mostly Big bluestem, a few other grasses, and a little Ironweed, Common milkweed, Sunflowers, lots of Buttonweed and a non native grass I can’t think of the name of. I’m curious to see what spring and early summer blooming plants are there. It sounds like the planted prairie could use some over seedling. The dominating big bluestem will have to be weakened if over seeding is going to be successful. Many groups have found success using Pedicularis canadensis. Others will plow up the prairie and start over. Stephen Packard scythes Big Bluestem to set it back. II found a miraculous roadside in Washington County NE (just north from Omaha) with about 6 clumps of butterfly milkweed. Often when I see butterfly milkweed here it does not make pods, but these volunteers were studded with fat pods. I took a couple of seedpods just as they split and set them on my kitchen counter until I had time to finish separating the seeds from the fluff, to share and plant. This week the container started hatching what sure looked like miniature milkweed bugs, as in your milkweed blog. I had considered these bugs competitors with the butterflies, but thanks to you I have shifted them into the pollinator category and will look harder for their cute little faces. Thanks, Anne and James both. I have long been a Chris Helzer fan from Nebraskaland, will watch your blogs for winter sustenance. Linda – great story, thanks! I’m glad you enjoy the blog and the magazine.